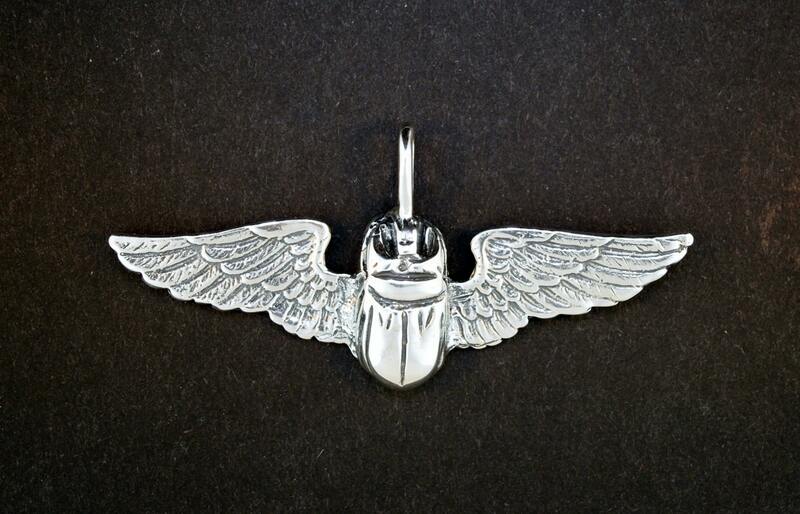 This is a winged scarab pendant in sterling silver which later lead to my scarab ring I also sell. It measures 1.5cm long and 4.5cm wide with a solid loop at the top to pass a chain. The design is based on the Egyptian scarab. This beetle was associated with the divine manifestation of the early morning sun, Khepri, whose name was written with the scarab hieroglyph and who was believed to roll the disk of the morning sun over the eastern horizon at daybreak. Since the scarab hieroglyph, Kheper, refers variously to the ideas of existence, manifestation, development, growth, and effectiveness, the beetle itself was a favorite form used for amulets in all periods of Egyptian history. They were often found buried with mummies to protect the dead and gain favor with the gods.